It is with some interest that as 2014 brings the 100th anniversary of the start of the Great War, a variety of events are planned worldwide in commemoration. One of these is at Antwerp, on the weekend of the 3rd-5th October 2014, where the pontoon bridge (‘The bridge of boats’) which featured in the siege of Antwerp in October 1914, is being rebuilt. The pontoon bridge facsimile will be constructed by engineers from the Dutch and Belgium armies and will be in situ for one week. Tourists will be able to walk across this bridge, over the River Scheldt, for 5 Euros a time. It is a less well known fact that during the Great War there was also a pontoon bridge built across the River Thames between Tilbury and Gravesend, which stayed in place for three years – 1915-1918. So what did this bridge look like? What did it cost ? How did shipping get through it? Surprisingly ,for such recent history, there is a scarcity of information. The bridge doesn’t figure on any historical ordnance surveys ,presumably in case they fell into the hand of the enemy. So what do we know about it? It appears to have stretched from the gardens of ‘Clarendon Royal Hotel’ -just east of Town Pier/ ‘Three Daws’, in Gravesend ,to a point between the ‘Worlds End’ and Tilbury fort entrance on the north bank. This would indicate a distance of around 750 – 800metres (820-875 yards). 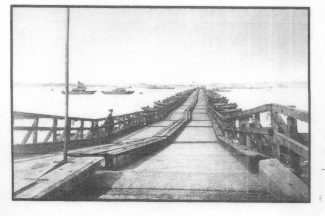 The timber pontoon bridge was floated on 67 lighters (a lighter being a large, usually flat-bottomed boat used to transport goods from shore to ship.) and was two carriageways wide – perhaps 20 feet. This would suggest a distance for the spans, between each lighter centre, of approximately 12 yards (36 feet). However the difference between high and low tides at this point on the Thames can be 24 feet (8 yards) so it is probably that at both ends there would be a longer spans to cope with the access onto the shore. Perhaps the bridge could have only been used twice a day, at the optimum tide levels? Also the pontoon bridge must have been quite sturdy to cope with strong tides and windy conditions. Certainly the floating landing stage still in existence at Tilbury riverside (built 1930) has a 80 yard long bridge from shore to ferry landing stage to allow easy access at both high and low tides to give a maximum gradient of 1:20. The pontoon bridge was reported in the ‘New York Times’ – December 27th 1914 as costing 375,000 US dollars to construct. 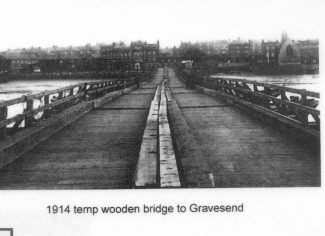 The report also states that the bridge is to allow troops to get from Kent to Essex in the event of German invasion. Both these statements seem suspect to me. Was it deliberate British ‘black’ propaganda being fed through the American press in the sure knowledge that German sympathisers would be reading it and reporting back to Berlin? The cost of 375,000 dollars is equivalent to in excess of £20 million pounds in today’s money – which seems a lot for a temporary timber bridge. Also the bridge would have been more useful in getting troops from Essex to the channel ports in Kent ,such as Folkestone, rather than the other way round. It might also have had another useful peripheral use in making a German naval attack up the Thames more difficult. Or perhaps the bridge had little practical use but was there to demonstrate to the enemy that Britain had the capability to move troops and equipment quickly if needed? In terms of its day to day use , it is reported that the bridge had a 800 feet section which could be opened to allow shipping through, this procedure taking two hours. Typically the bridge would have this section opened during the day and closed at night. It is not clear why the moveable section was so large or how the movement could be achieved in bad weather, presumably tugs could tow it into position? The pontoon bridge was manned and maintained by the Port of London Authority. There are several photographs of the bridge and also it featured in the autobiographical tale of the escape from England of Gustav Pluschow (variously Gunther Pluschow or Gunther Plueschow – see comment below). He was the only German prisoner of war to successfully escape back to Germany in the war. There are also records of the steamship ‘Fredriksberg’ crashing into the bridge and sustaining damage in January 1917. Beyond that, the bridge remains something of a mystery. So, should this bridge being commemorated in some way ,as its 100th anniversary draws near? Certainly in Antwerp their ‘ Bridge of boats’; which, incidentally, was both built and then blown up, by the British Royal Marines under the command of Winston Churchill, featured heavily in the story of the siege. The bridge, being the only escape route from the city to the channel port of Ostend was heavily shelled during the siege by German artillery. The Tilbury to Gravesend pontoon bridge saw no such action but was nevertheless an important historical structure. If nothing else it was the first structure ever built east of the City of London which bridged the Thames. All this 75 years before the opening of the QE II bridge at Purfleet in 1991. For this fact alone, the Tilbury to Gravesend pontoon bridge should be worthy of commemoration. As mentioned in the article, the bridge was mentioned on page 2 of the New York Times edition dated December 27, 1914, although there are a few minor inaccuracies in the report. The photo’s shown show a small section of pontoon with an estimated length of 600m. Are there any records of the pontoons spanning the river. It’s a strange idea so I’m just wondering if it was a feasibility trial. Many thanks, Rob Chandler.